An easy, no-installation alternative to our Weldless Whirlpool kit. Just clamp the whirlpool arm in place when the boil is complete, and start your whirlpool. This racking cane is made from 1/2" diameter x .035 304/304L stainless steel tubing. Whirlpools are a great way to lessen the amount of trub in your fermenter. The whirlpool motion creates a tight cone of trub in the center of your boil kettle. Once it's ready to be transferred, just start the siphon and watch the clear wort drain into your fermenter. 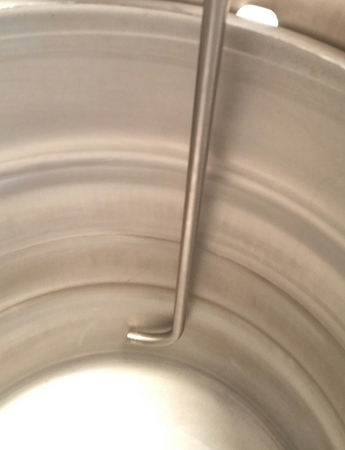 Whirlpooling while chilling with an immersion chiller also creates more turbulence around the wort chiller, which decreases the overall time it takes to chill your wort. Faster chill times create a better cold-break, making your wort even clearer. 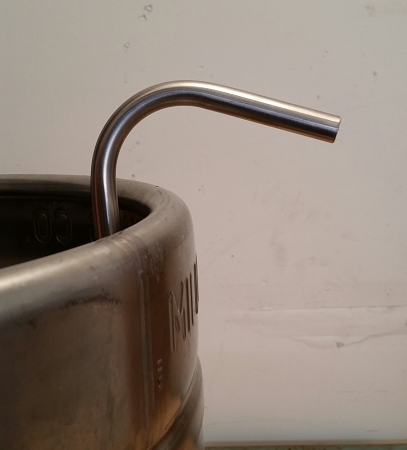 This whirlpool cane allows me to create an effective whirlpool in my keggle boil pot without drilling a new hole. You will need to devise a clamping method to keep the cane in place when whirlpooling. I also recommend the 135 deg bend pickup tube so you are not drawing the cold-break and hop material that will pile up nicely in the center of the pot after the whirlpool. Awesome, well designed and works perfect for my setup. I am using this in a Keggle without it attached and therefore this allows me to position this as needed. Used this for a no drill whirlpool option my kettle. Combined with a compression fitting, camlock and a clamp from Home Depot. Helped chill my wort down to pitching temps super fast. Definitely recommend this if you are looking for an economical whirlpool solution and can't/won't drill your kettle.